In medium bowl, beat eggs, milk and pepper with wire whisk or fork until well blended. In 10-inch nonstick skillet, melt butter over medium heat. Pour egg mixture into skillet. As mixture begins to set on bottom and side, gently lift cooked portion with pancake turner so thin, uncooked portion can flow to bottom of skillet (avoid constant stirring). Cook 4 to 5 minutes or until eggs are thickened throughout but still moist and fluffy. 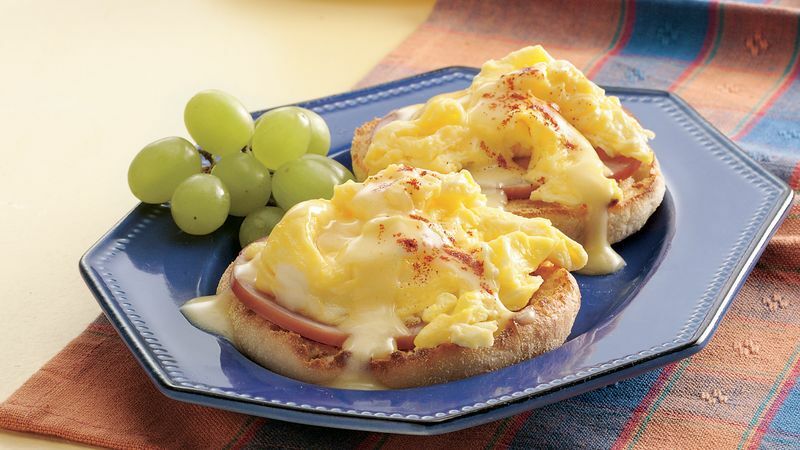 In 2-cup microwavable measuring cup, microwave hollandaise sauce on High 1 minute 30 seconds to 2 minutes or until hot; cover tightly to keep warm. On large microwavable plate, place Canadian bacon slices in single layer. Microwave on High 45 to 60 seconds or until warm. Place 2 toasted muffin halves on each plate. Top each muffin half with slice of Canadian bacon, about 1/3 cup eggs and 2 tablespoons hollandaise sauce; sprinkle with paprika. Hollandaise sauce from a jar won't separate when it's heated so it's a nice alternative to the traditional sauce made from scratch that often has a tendency to separate.